Travelling to remote destinations means that you are far from home, and all your belongings. The best viewing locations for the 2019 solar eclipse are within the La Serena region of Chile – primarily a domestic travel area with a lower standard of accommodation and infrastructure than would normally be expected by international travellers. I have compiled a brief list below to help you prepare for your solar eclipse adventure and make the most of this stellar opportunity. I am going to assume you have your eclipse viewing kit sorted, but if you don’t check this out from the American Astronomical Society. Sunglasses Another obvious one. But seriously. It can ruin your whole day not having sunglasses. Take them with you no matter what the weather forecast says. Seriously, when have you ever regretted bringing sunglasses?? I bet you can remember many times you wished you had them with you. N.B DO NOT view the eclipse through standard sunglasses. In fact, use our discount code ECLIPSETRAVEL2019 for a 30% discount on these trendy AAS approved HALO glasses. Noise Cancelling Headphones The difference these make reducing noise whilst flying is quite incredible, and really helpful if you need to shut out a noisy airport or a crowded bus for a while. The collapsible ones are pretty compact and it helps protect them too. Make sure you get all the jack adapters in case you need to go old school; don’t get complacent from bluetooth use as that won’t help if you can’t use your phone. A Decent Scarf Weather in La Serena is unpredictable, but the average temperatures for July are 7-15 degrees C (45-59F) so be prepared for the cold and don’t forget a good scarf. I regularly use mine to keep warm, to keep the sun off my neck, as a pillow when resting, and for wrapping anything that might be fragile in your day pack. Versatility is your best friend when on the road. Universal Power Adapter There is nothing more frustrating than not having the right power adapter. Chile uses 220V so be sure that your devices & plugs are safe for use if you’re travelling from the US in particular. When traveling around countries within South America you don’t want to have to worry about a bunch of adapters. Get one of these anything to anything modern day miracles – job done. Double Plug So simple, so brilliant… double your charging ability. Now you can charge your laptop and your phone at the same time! Or become the hero of the airport transit lounge. Need power? Use some of mine! Sunblock I was trekking in Patagonia in winter and I got sunburnt. Don’t let the cool temperatures fool you as the sun can still be harsh and you will be spending a lot of time under it. I always carry sunblock. Travelling can be thirsty work for your skin too, so if you can find a good moisturising sunblock you can kill 2 birds with one stone. Alternatively, depending on where you are going, a sunblock with insect repellant isn’t a bad option. Be sun smart people. A Good Pen No brainer right? Wrong. The amount of people I have to lend my pen to so that they can fill out entry cards on flights is quite incredible. Not that I mind… but it’s probably the first thing I throw in my bag. Also good for writing down directions. And the odd bored doodle on a flight. And don’t try and go all fancy with a pencil – you won’t be able to fill out your departure card with that. Pack a good old blue pen. In fact, why not put in 2! Transparent Cable Bag Save yourself form having to rifle through your entire bag to find what you want. You can see what’s there before you open the bag. They are so useful, especially when it comes to the 600 cables I seem to have to carry around for my phone, laptop, tablet, small earbud headphones, extra batteries, USB drives, spare XD card for camera etc etc. Also ideal for toilet bags and for snack bags. Filtered Water Bottle I like to have a BPA Free, eco-friendly filtered water bottle in my pack at all times. Sure you can buy water in bottles from stores, but let’s think of the planet people. Plus water from a fountain is free, and it is just nicer having your own drink bottle. Check out my blog on water bottles here. Decent Point and Shoot Camera The best camera is the one you take with you… or is it the one you use… something like that anyway. Sure, you can still take your DSLR or similar to try and get those remarkable shots, but the little camera in your day pack takes remarkably good snaps and will always there for you. Rely on your phone for photos at your own peril (think battery life) – you have been warned. First Aid Kit Blisters. Scratches. Bumps. The perils of traveling. Not serious wounds but common ones and a bit of a pain if you aren’t prepared. Make up a custom first aid kit with a small selection of various bandages, antiseptic, painkillers, antacids and some baby wipes – perfect for getting that empanada stain off your collar. 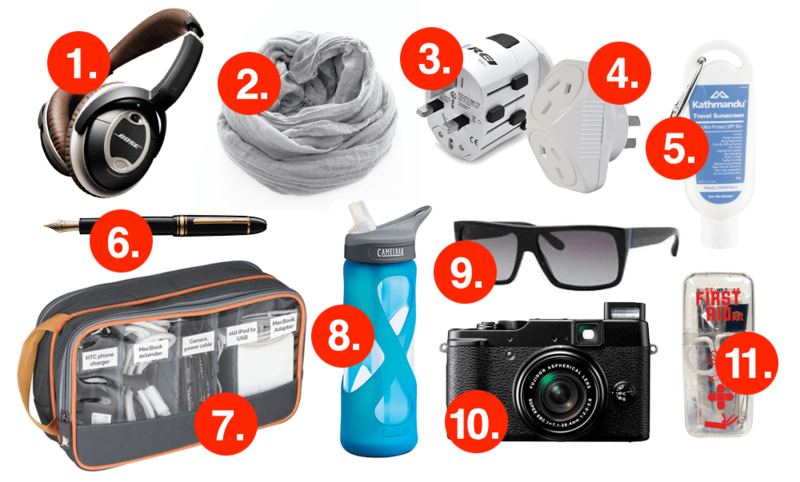 This is a list of things that you will almost certainly find useful on your trip. Of course there are other items such as binoculars, jackets, beanies, gloves, books, rechargeable power packs, various devices, etc. that you will no doubt already have firmly on your packing list. The one that is probably missing is a hat, which I usually always carry as well. Hopefully it is of some help. Enjoy your travels! Eclipse Travel will help you fulfil your travel dreams of experiencing some of the world’s most remote and amazing destinations. If you have any questions please contact us.